Michael Jordan’s lawyer told jurors on Wednesday August 12, at a civil trial over the unauthorized use of the star’s name in a steak ad that the market value of Jordan's moniker to the Nike sportswear company was at least $480 million. 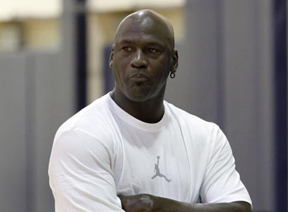 Each commercial use of Jordan’s name is worth more than $10 million, he estimated. The price tag on Jordan’s name is the central issue for jurors who will decide how much Dominick’s Finer Foods should pay in damages for a 2009 Sports Illustrated ad that congratulated the basketball legend by name on his Hall of Fame induction. The ad also included a $2-off coupon above a photograph of a sizzling steak. During opening statements at the federal courtroom in Chicago and with Jordan looking on from a plaintiff's table, his attorney began by listing his client’s accomplishments, including six NBA championships with the Bulls. During his opening, Sperling displayed a chart with companies whose products Jordan has endorsed and how much he made from each deal. It included the $480 million from Nike from 2000 to 2012 and $14 million from Hanes underwear. Sperling added that Jordan made a total of $100 million from his identity in 2014, a decade after retiring as an NBA player. Dominick’s acknowledged it wasn’t authorized to invoke Jordan's name, so the sole issue for jurors is how much to award Jordan in damages. In his opening, Dominick’s lawyer Steven Mandell suggested that plaintiff's attorneys overvalued Jordan’s name. It might be worth $10 million in some contexts, he said, but not necessarily in a one-off ad. Bu Sperling likened Dom­inick’s use of Jordan’s name to someone cutting into the feed of a cable company with 250 channels to watch just one channel. Then, after he’s caught, he offers to pay for one channel only.